Every summer holiday we like to set ourselves a project. 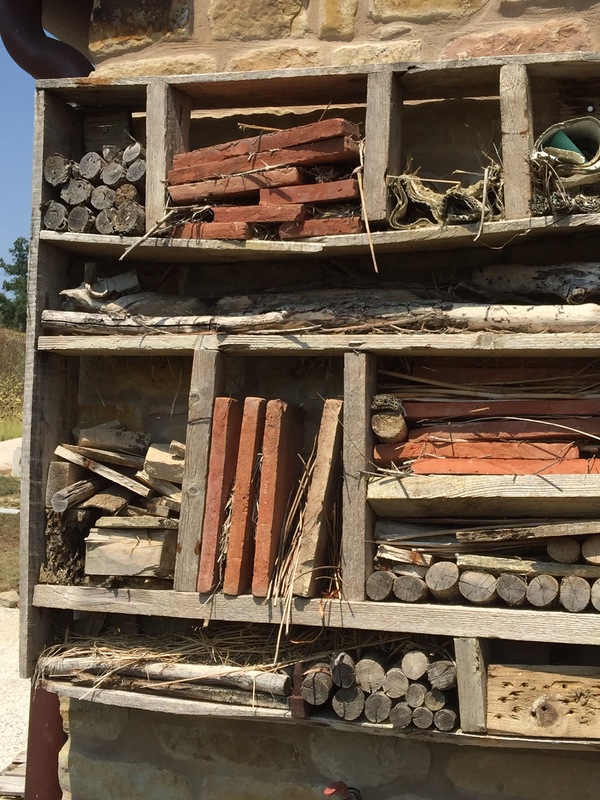 In previous years we have used scrap wood to make bird tables, lavender from the garden to make felt hearts and old pallets, tiles and branches to make a bug hotel. This year we decided to change up a gear. 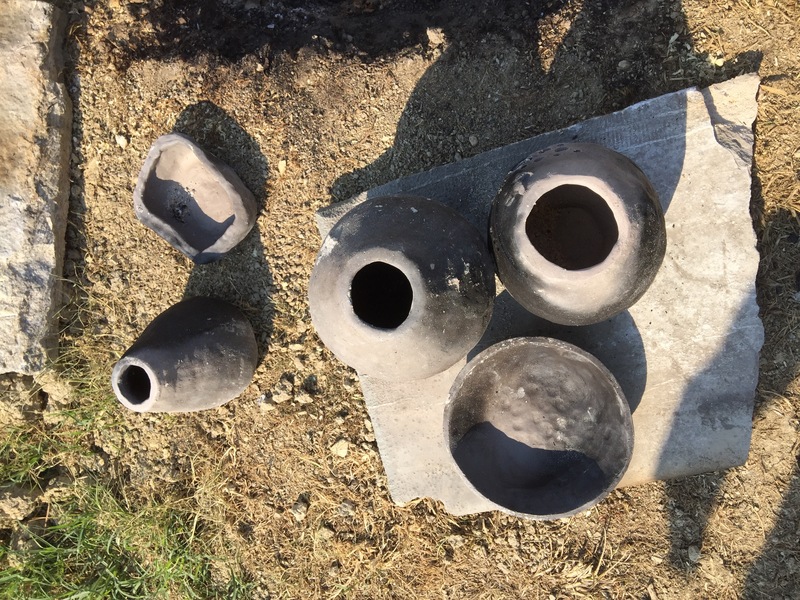 We were going to make clay pots and build our own kiln to fire them in. Simple huh? Well we started off by remembering to bring two large bags of clay on holiday with us. Fortunately we were driving so we just popped them in the car along with some pottery tools and we were on our way. 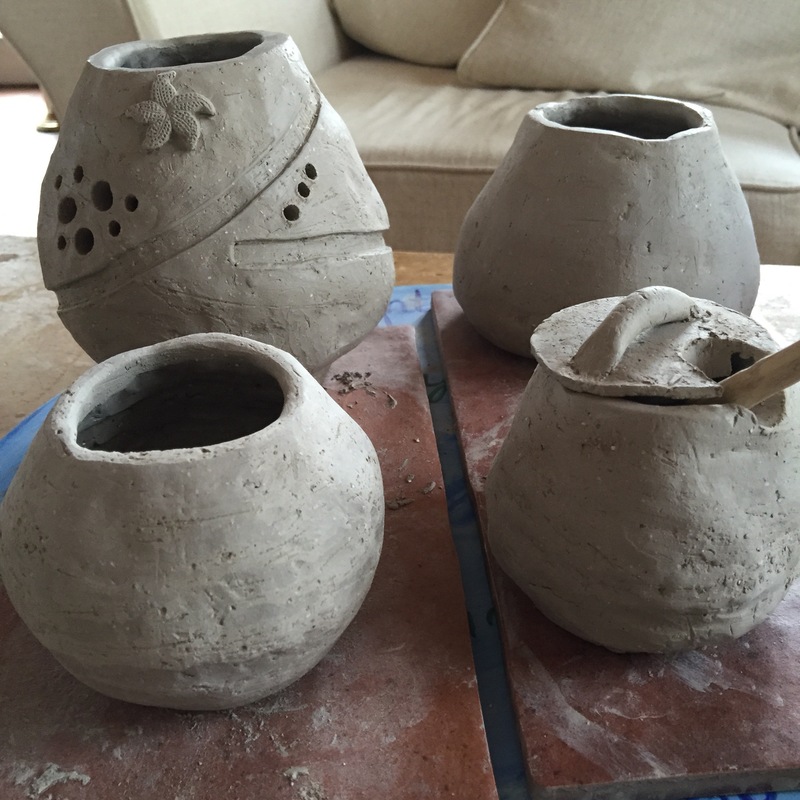 My 13 year old son had never made a pot before but really excelled in his creations. I have been doing pottery for several years and really enjoy hand building as opposed to throwing on a wheel which is just as well as I don’t think we would have fitted a pottery wheel into our car. 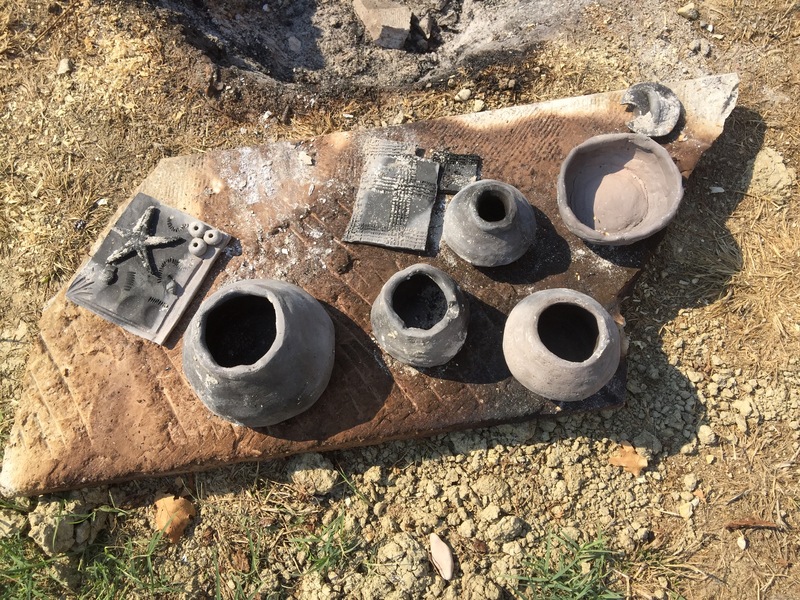 The heat, often in the high 30s proved to be a bit tricky as our clay was drying out very quickly but we soon found that a wet cloth over the clay was all that was needed. 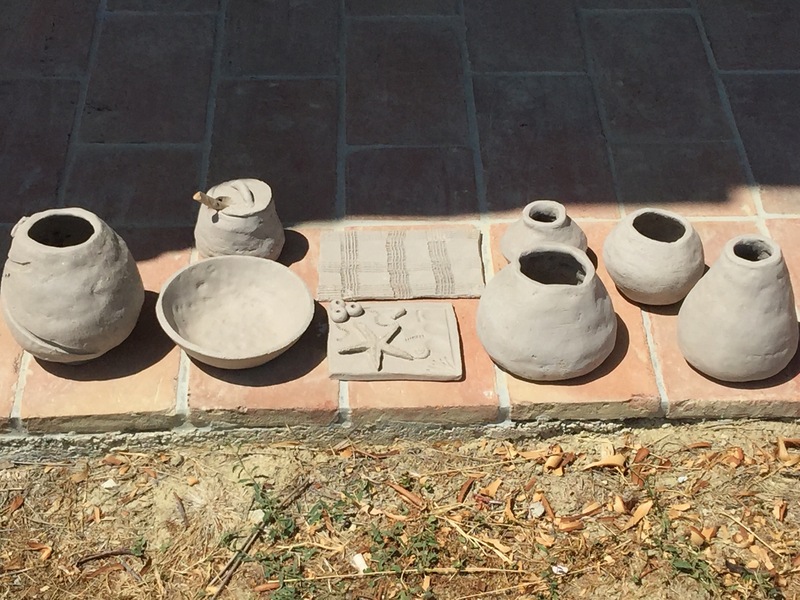 Over the course of a few days we had created quite a haul of pots and tiles. My son had even progressed to making a honey pot with a lid. We also had family staying with us so my brother in law and sister in law joined in the venture, turning out a very nice whatchamacallit and thingumbob. Not bad for their first exposure to the world of ceramics. It really is quite a bit more difficult to roll out a coil than you might expect and then turning that coil into a pot with any degree of symmetry takes a little practise. But that was only part of the adventure. As we left our pots to dry out over a period of several days we still had to prepare our pit kiln. We decided to look online for advice about building our kiln. There is plenty of advice. Some of the videos we watched even said rather unhelpful things like ‘don’t try this at home’. Obviously we had to ignore such advice. Well it turns out there are many ways of making a pit kiln but they nearly all start with having to dig yourself a pit. So we waited for a day when there was a small drop in temperature to the high 20s and we chose our spot. Somewhere a large hole would not offend my lawn proud husband. We had not had any significant rain for weeks and our soil was cracked and hard baked. I was not looking forward to digging this pit. 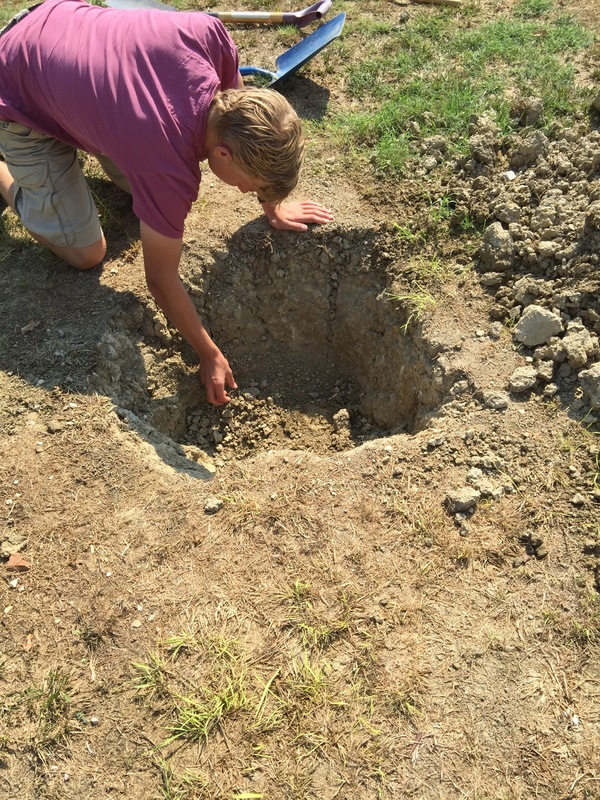 We got a fork and two spades and my son and I began to dig and to our surprise once we got through the top hard layer of sun baked earth the soil beneath gave way quite easily. Within about 45 minutes we have dug out our pit. It was about 18 inches deep and just over two feet wide. Now all we had to do was turn our pit into a kiln. We decided to take bits of advice from the various sites we had discovered on line which suited the materials we had to hand and how much effort we wanted to put in. We were not going to line our pit with bricks, but we were happy to make a trip to the local hardware store to buy sawdust. The only sawdust they had was for use as pet bedding and was impregnated with a ‘citrus aroma’ – we bought it anyway. We thought it might bring interesting effects to our pots. That’s if they survived the firing. One site told us they had had a 40% breakage rate! So the day came when we deemed our pots and the weather forecast to be dry enough to begin loading our kiln. 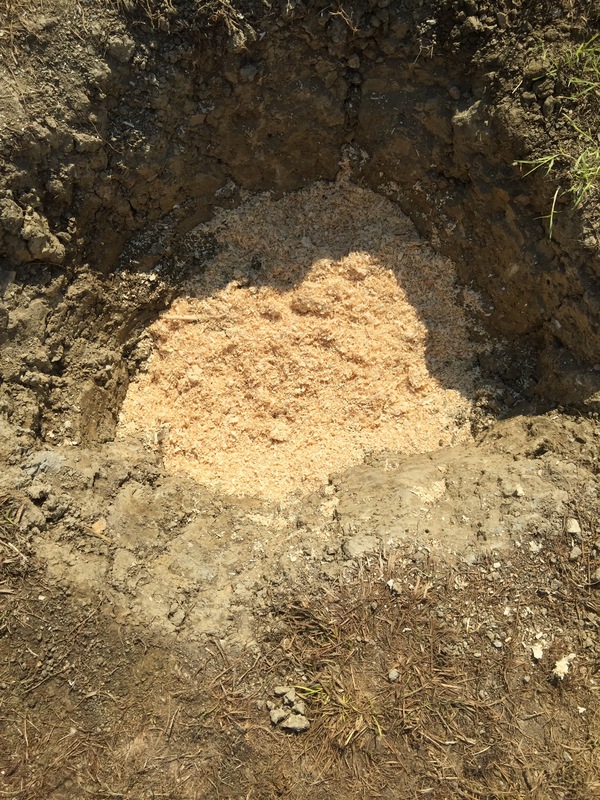 By now we thought we had mastered the basics and were going to use our sawdust and materials we had on site. We poured a layer of our citrus infused sawdust in the bottom of our pit and then placed the bigger of our pots on top. We stuffed sawdust inside them too and packed it all around them. 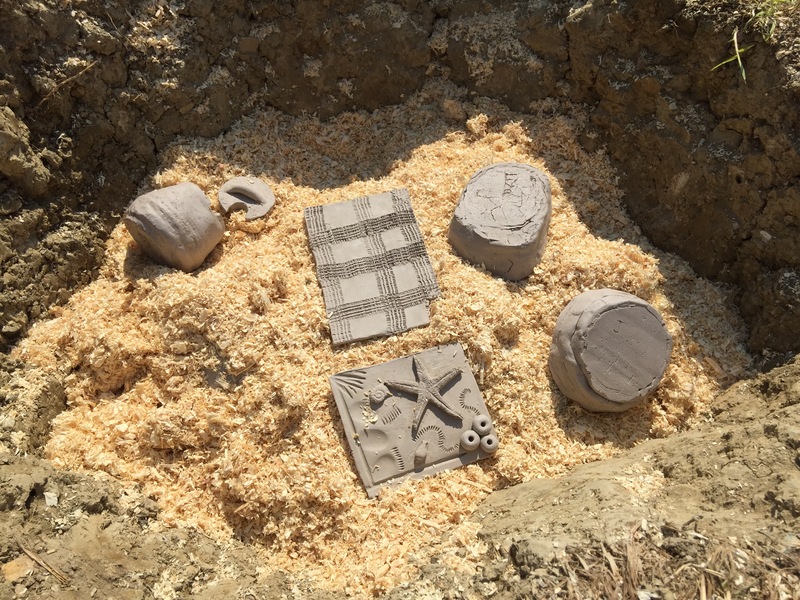 We then covered them with another layer of sawdust and placed our smaller items on top. The remainder of the sawdust was spread around and completely covered all our treasures. At this point we should have said a prayer but we forgot so we just crossed our fingers instead. Now the real Boy Scout bit started. 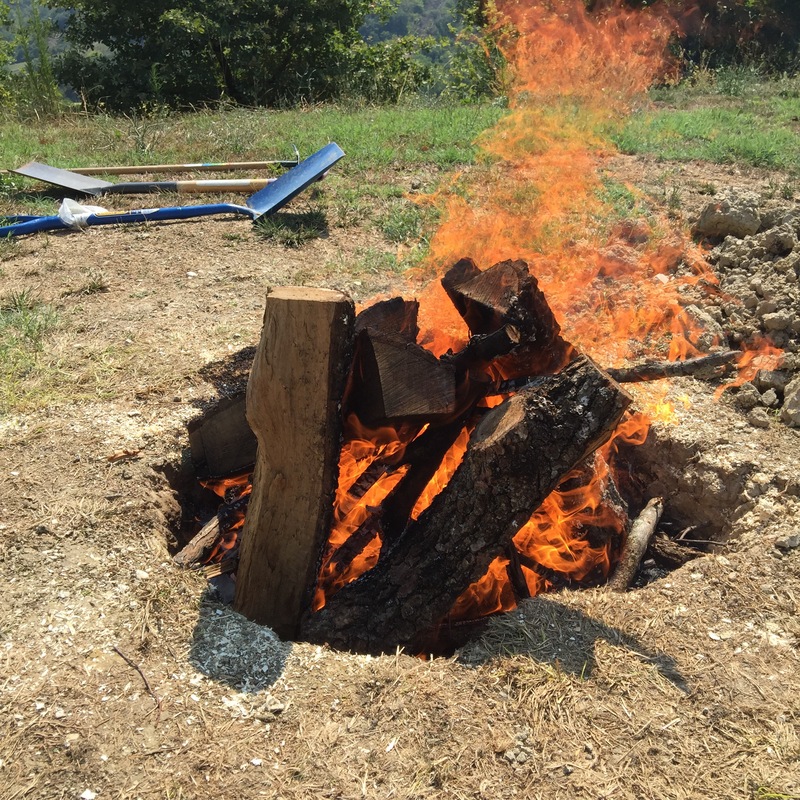 We needed to build a raging fire. We had been collecting paper and boxes for a couple of weeks in anticipation of this project and we had plenty of dried twigs and large logs. We placed the paper all around the sides of the pit on top of the sawdust and then built a pyramid of twigs in the middle. My son did the honours of lighting the paper. We couldn’t have been more amazed as the paper caught straight away as did the lovely dry twigs and within a matter of moments we had a raging fire. I must say at this point that we had obviously done a thorough health and safety risk assessment before embarking on this endeavour and we had two watering cans full of water on site in case of emergencies. We looked on triumphant. As the fire caught we added large logs and stood back, mostly because a raging furnace on a day when it’s already 33 degrees is just a bit the other side of cosy. Are the pots still in one piece? 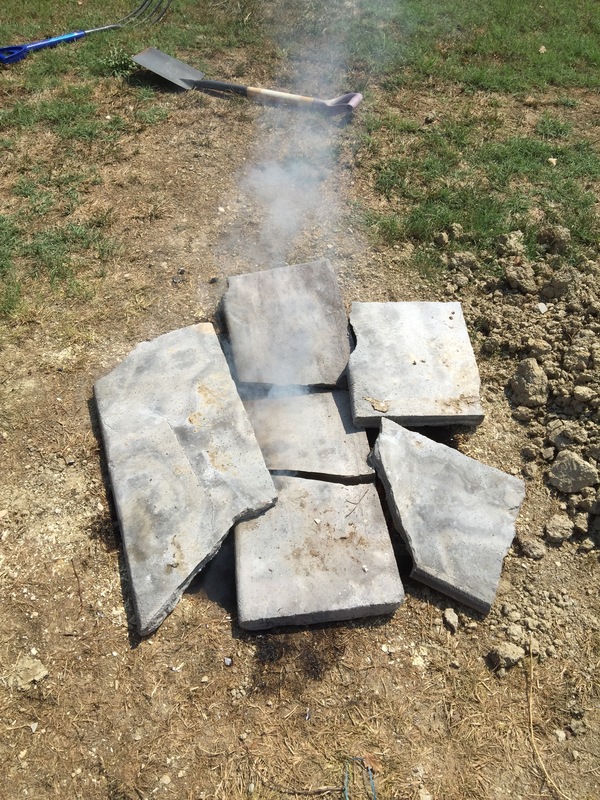 Smoke signals – but what do they mean? Once the fire had almost died down to hot embers we covered the top with a couple of old stone steps, allowing room for the smoke to escape and air to get in to keep the smouldering process going. Then we just had to wait for the next twelve hours. In reality we waited nearly 24 hours as the pit kiln continued to smoulder for the rest of the day. The next morning I advised caution. The chances of anything surviving in tact were minimal. 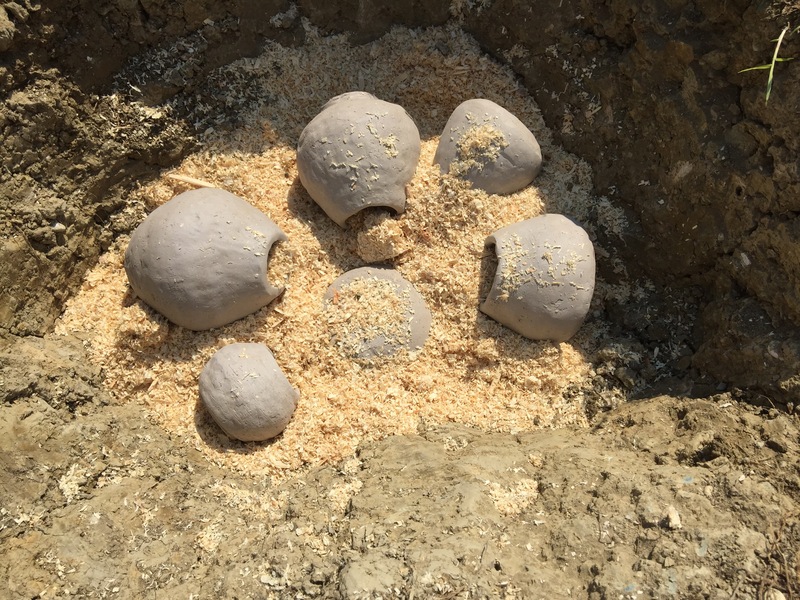 We should just see it as an interesting process that was fun to do and not be upset by the carnage that we would undoubtedly witness when we dug our pots out. My son nodded. We found some heavy duty gloves, as the slabs on top of the kiln were still hot, and pulled the slabs away. 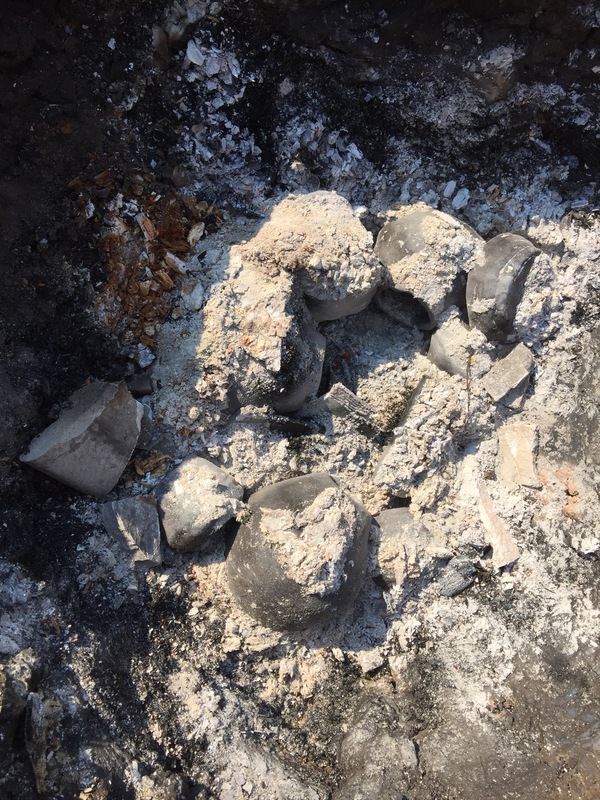 There poking through the ashes appeared to be our pots! They were still hot but as we unearthed one after the other we found that nothing had broken at all except a tile that had already broken before entering the kiln. We had an almost 100% success rate! Could those be our pots? Buoyed by our success we intend to have another go. 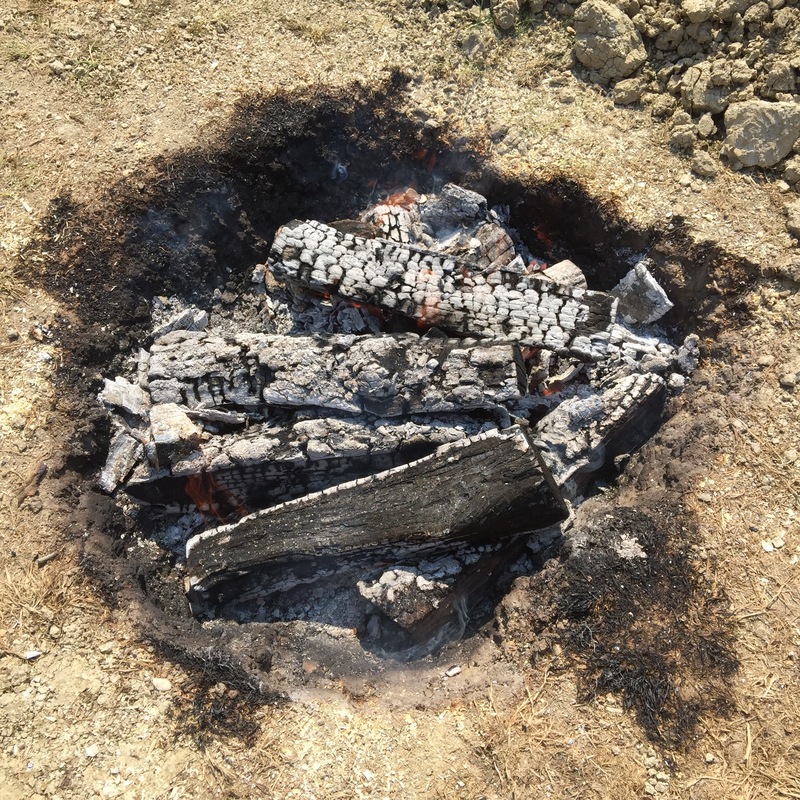 My son has already emptied the ash out of the pit in preparation. I can’t say that the citrus infused sawdust had any marked effects but we intend to do a bit more research on what we can add to our firing process next time. Watch this space. How to discover who the spy is at parties!